Did CIA have access to Aadhaar information? - Aadhaar FAIL! On August 24th 2017, WikiLeaks published secret documents from the ExpressLane project of the CIA pertaining to the cyber operations the OTS (Office of Technical Services), a branch within the CIA conducts against liaison services. The OTS provides a biometric collection system to liaison services around the world with the expectation for sharing of the biometric takes collected on the systems. Additionally, the CIA has developed ExpressLane – a covert information collection tool to secretly exfiltrate data collections from these systems without the knowledge of the vendors as well. ExpressLane installs and runs covertly behind a benign splash screen indicating a software upgrade and is used when OTS agents perform on site upgrades on the biometric system. The installation raises no suspicions other than the minor notices which don’t appear to be out of the ordinary for a software installation. The core components of the OTS system are based on products from Cross Match, a US company specializing in biometric software for law enforcement and the Intelligence Community. The company hit the headlines in 2011 when it was reported that the US military used a Cross Match product to identify Osama bin Laden during the assassination operation in Pakistan. This company also provides biometrics collection systems for UIDAI’s Aadhaar in India. The response to these revelations in India has been astonishingly muted. A foreign government having access to confidential and highly accurate information on citizens of India amounts to an attack on India’s sovereignty. The existence of Aadhaar itself now becomes a government sanctioned weapon against the country and citizens. The Aadhaar must be destroyed. The few reports in media restrain themselves to very conservative reporting of the actual leaks without committing themselves to stating the implications for the country. This too is concerning, because it indicates an inadequate comprehension of how tech works in the media and renders the media toothless when it comes to providing public oversight on the highly insecure progression of the Digital India project. On its part, the UIDAI has issued its standard vodoo denials. No explanations, no data, no alarm, no need for any investigations, nothing. 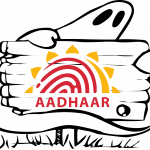 Assurances that “all is well, don’t worry” is all the UIDAI appears to have on any of the mounting concerns about the Aadhaar being illegally imposed on the citizens of India with blatant disregard to repeated orders of the Supreme Court. And of course, flat out lies – the hallmark of anything supported by the Modi government. Here are some claims debunked. And here we thought UIDAI filed a case against Abhinav Srivastava, co-founder ofQarth Technologies Pvt. Ltd, who released an entire app that made unauthorized use of Aadhaar data e-kyc, then let him go, because he didn’t have bad intentions. And oh, they complained about unauthorized access and then also claimed that no data was breached. We get it. There was no breach. He was using an authorized api without being authorized. No breach. Just reading news on the UIDAI is enough to give anyone who understands tech security high blood pressure. No, Aadhaar most certainly doesn’t have stringent security features to prevent unauthorized transmission of data. 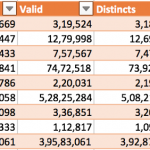 Aadhaar devices were not even encrypted till well after UIDAI started claiming 90% enrolment across the country (another dubious claim, for another day). 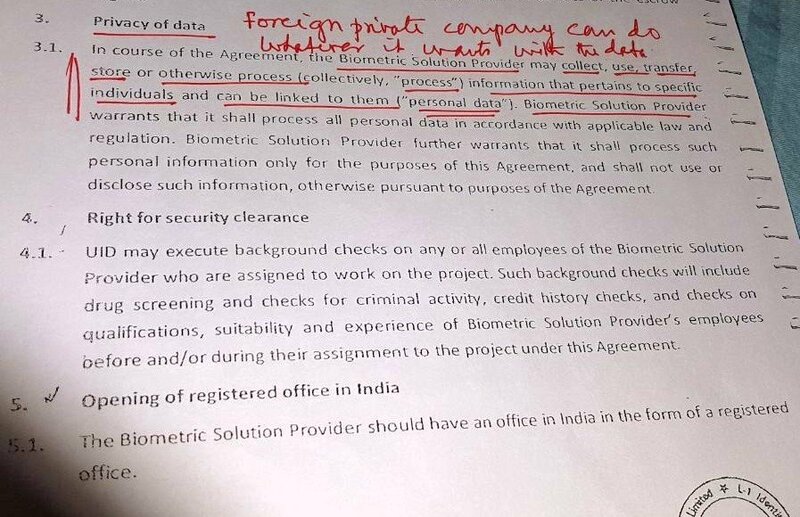 This is a breathtaking lie, because the CONTRACT UIDAI had with L-1 Identity Solutions Operating Co Pvt Ltd, Morpho and Accenture Services Pvt Ltd, says that the company was given Aadhaar data access “as part of its job“. This contract has also been reported and objected to in the past and on this blog as well in 10 big problems with the Aadhaar UID card project. Golden rule in C-Sec is: If physical access is compromised, everything is gone. Wikileaks talks about physical access. It is about installing a backdoor on the source where biometric is acquired at the device driver level. Encryption argument is useless in that case. But encryption != Security. Previous post: ആധാര്‍: 50,000 കോടിയുടെ പെരുംനുണ! How does one become a contributor to this site? I have my share of horror stories/encounters/frustrations with regards to aadhaar. I am a freelance writer/activist, organize RTI campaigns for civic issues in BLR. I have been spreading the word about how Aaadhaar is a scourge. Lately, I am a little exhausted countering of all people well-heeled techies who think aadhaar is a silver bullet and as benign as grandma’s love. I need to up the ante. 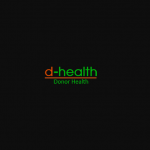 Hello Chitra, I have sent you an email with information on how you can contribute here.